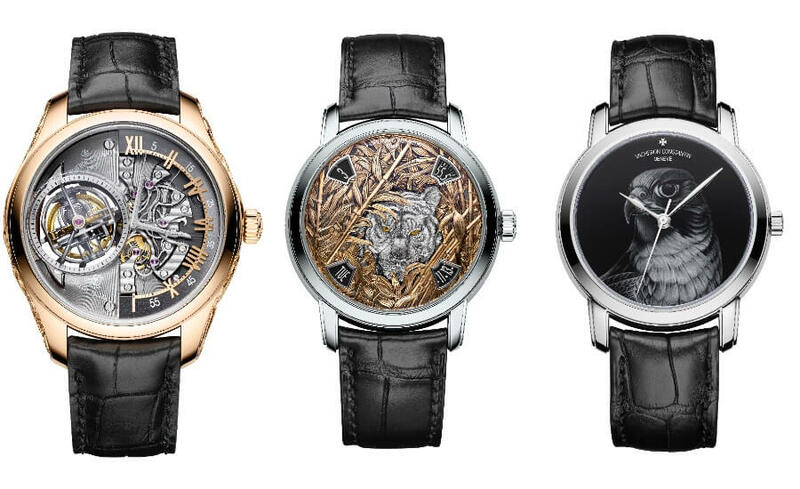 Vacheron Constantin has just unveiled an exclusive assortment of one-of-a-kind models created by its Les Cabinotiers department. 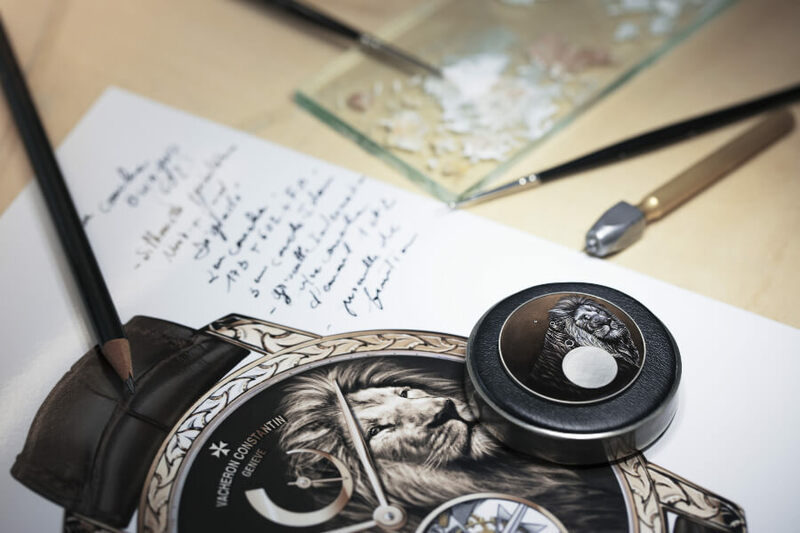 The power of the majestic wild animals adorning the dials and cases reflects the potency the stunning work involved in associating the watchmaking expertise of Grand Complications with the mastery of Artistic Crafts. 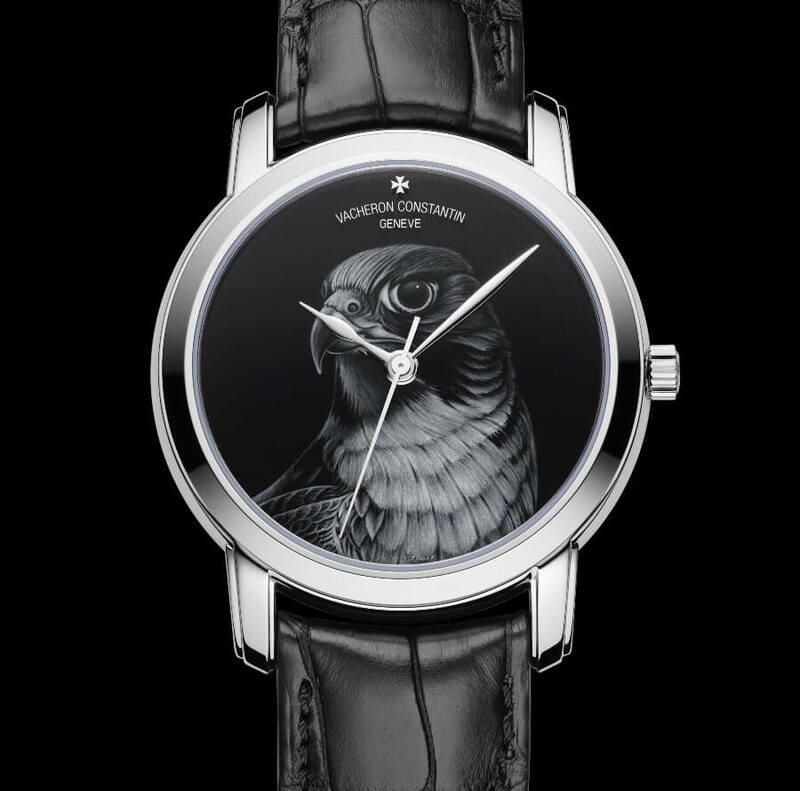 The strength of a bird of prey or a reptile, and the panache of a feline, convey the values of the Maison: tradition and innovation, craftsmanship, hand finishing, extreme care for details, as well as elegance. 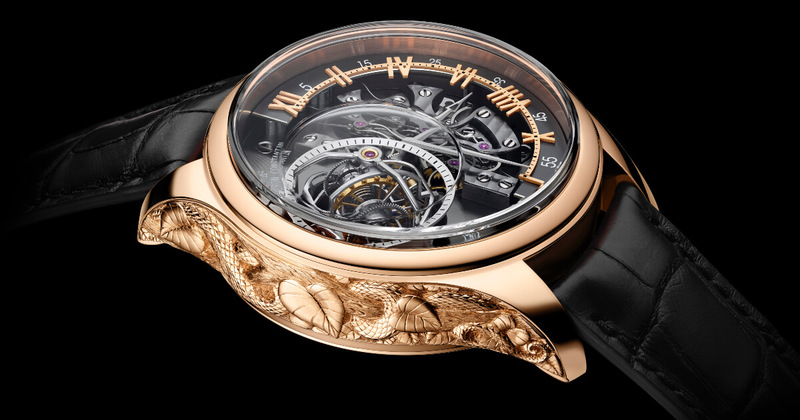 Through this eloquent mode of expression in which it excels, Vacheron Constantin reinterprets each animal family, from savannah to jungle, earth to sky, myth to reality. A universe that will naturally inspire the bespoke orders that are the essence of Les Cabinotiers. 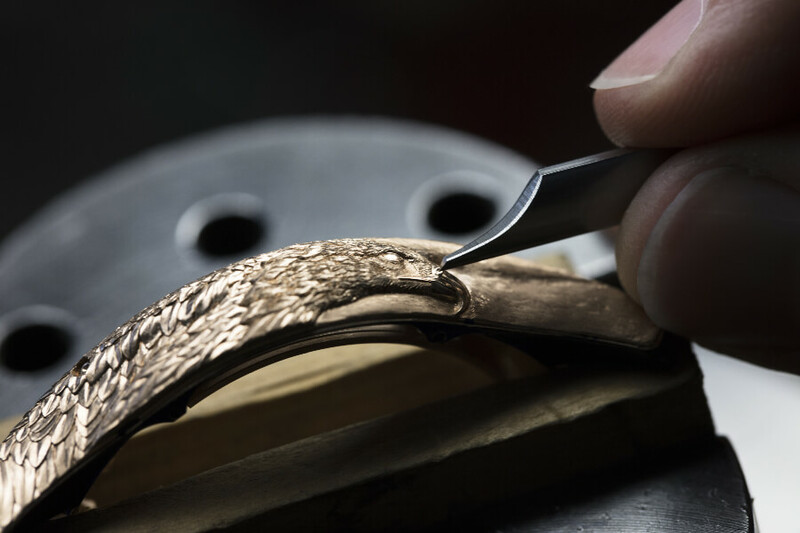 Vacheron Constantin Les Cabinotiers stands for one-of-a-kind bespoke technical, aesthetic and artistic challenges. 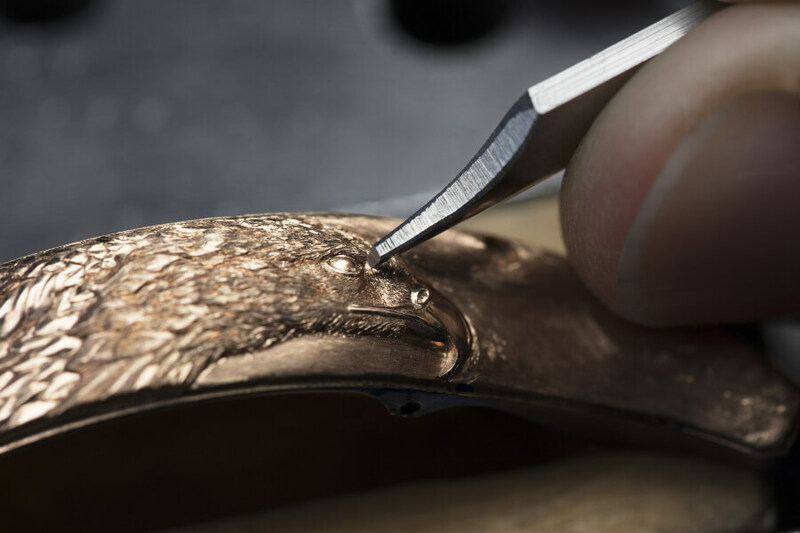 Across three centuries, Vacheron Constantin has been perpetuating the tradition of “Les Cabinotiers”, the name given to the prestigious and cultivated watchmakers who exercised their art in light-filled workshops located on the top floors of Geneva buildings. Exceptional bespoke timepieces were devised at the time, brimming with a rare degree of technical and aesthetic complexity, inspired by astronomy, science and art. Today, Vacheron Constantin continues to take up these highly technical and incredibly creative challenges through offering its customers one-of-a-kind models, as well as specially commissioned bespoke watches. Engineers, designers, master watchmakers and artisans combine their imagination, their expertise and their passion in giving life to this embodiment of horological expertise and extreme refinement. 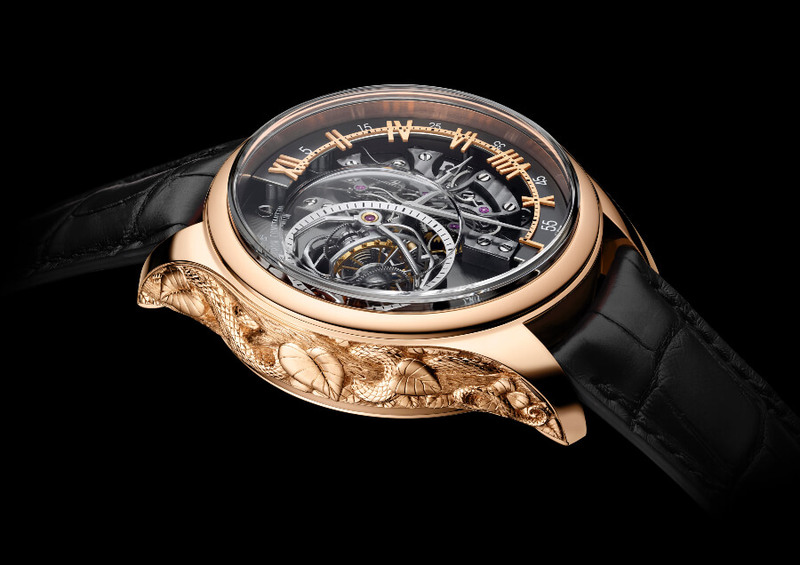 Humming to the beat of a minute repeater or an armillary tourbillon, and embellished with enamelling and engraving, “Mécaniques Sauvages” spring to vibrant life, gaze sharpened and instinct heightened, ready to leap into action. Horological expertise takes the form of seven complications, including a rare type of minute repeater equipped with a centripetal system enabling both effective sound diffusion and a 55-hour power reserve. Intaglio fine line and pounced ornament engraving techniques bring depth and light to this creation. Mastering these techniques requires at least ten years of experience. They vividly highlight the determination, courage and strength of the eagle, whose visual acuity is reproduced in its piercing gaze. 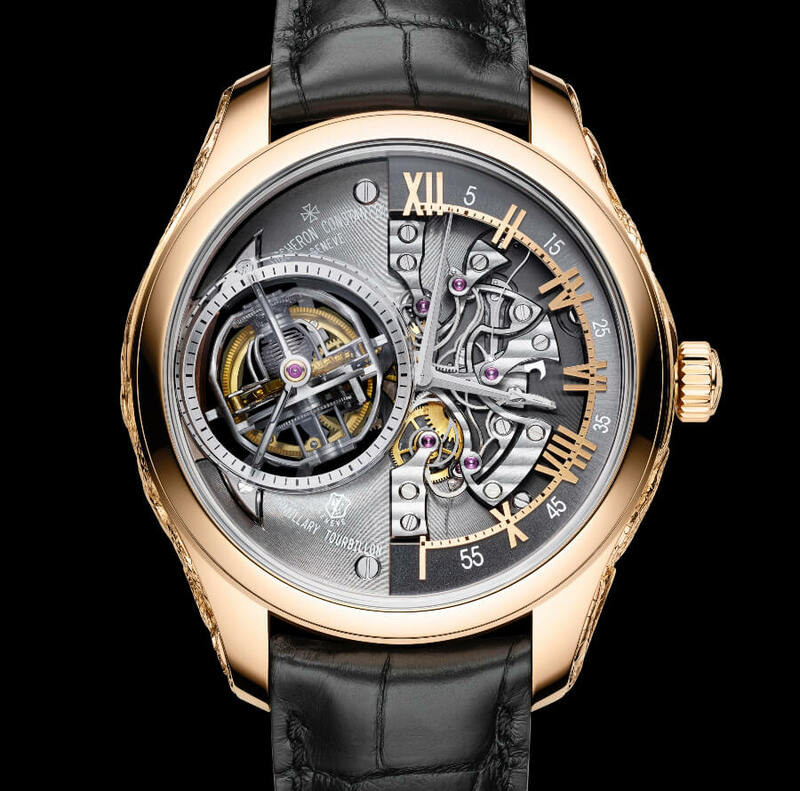 Six patents have been filed for this exceptional timepiece equipped with a double retrograde armillary tourbillon, derived from the Reference 57260 watch with its 57 complications. High-tech materials such as silicon for the pallet-lever and escape-wheel, as well as aluminium for the tourbillon carriage, further enhance the precision and durability of this timepiece and lend a light touch. 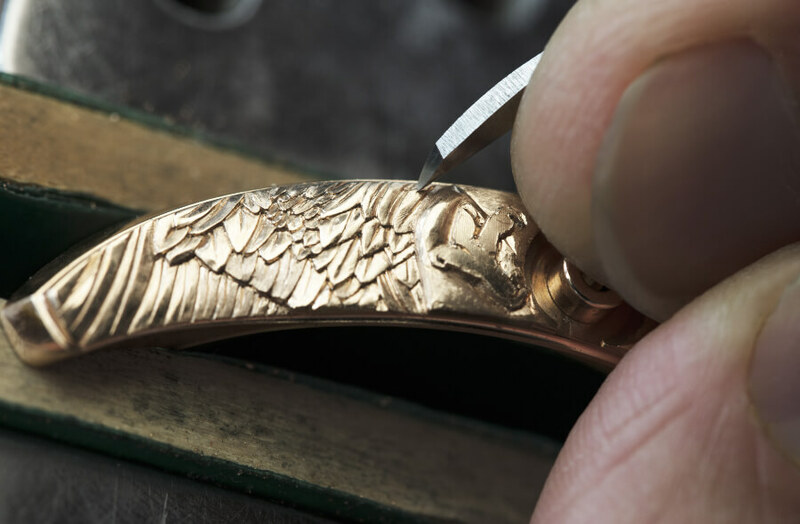 The patience of the engraving artisans and their love of fine workmanship are clearly apparent in the engraving work on the snake surrounding the caseband. 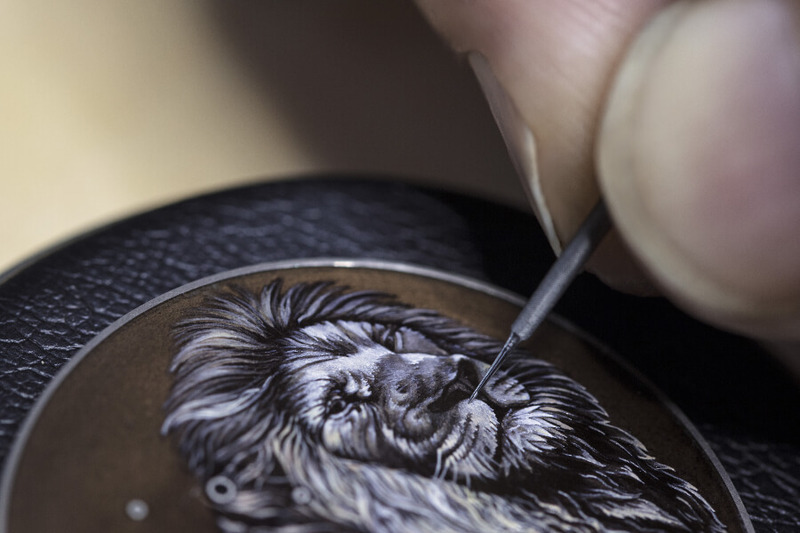 The Maison’s signature hand finishes have served to craft the model, highlighting the matt and brilliant surfaces punctuating the dial, giving life to the scales of the animal. e art of suggestion is extremely subtle, since the precision of the visible portion enables the observer to imagine the reptile in its entirety. 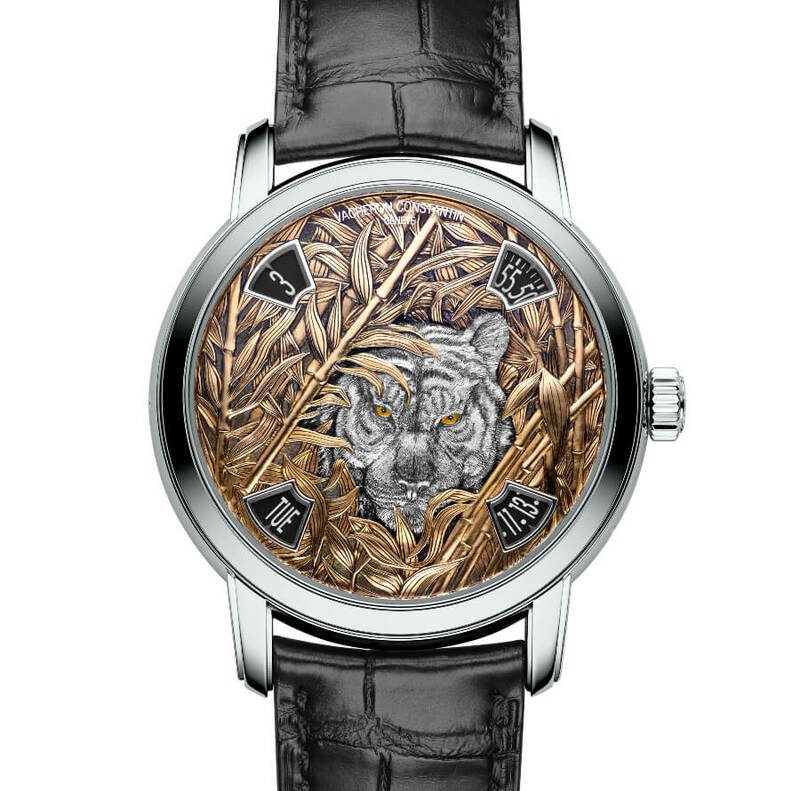 In this majestic model, the harmonious centrally aligned dial composition echoes the serenity radiating from the lion calmly surveying his surroundings. The fine strokes enable a realistic portrayal of the scene. The horological power of this model – featuring a Maltese cross-shaped tourbillon as well as a 14-day power reserve – evokes that of the noble beast it depicts, by conveying a sense of both strength and endurance. is technical combination is matched by a particularly tricky combination of skills: the case is engraved, while the dial is coated with grisaille enamel. This technique consists in coating the gold plate with a uniform dark brown layer and, after firing in the kiln, in applying an extremely rare type of white Grand Feu enamel known as “Blanc de Limoges”, in order to endow the material with subtle shades of grey, brown and white, as well as creating shading effects. The spectacular work of the master enameller is a fascinating invitation to contemplate this masterly animal. This exotic and inventive expression of time is equipped with a 2460 G4 calibre driving four displays appearing through four apertures. The hours, minutes, day and date are arranged around the dial periphery so as to give pride of place to Artistic Crafts. 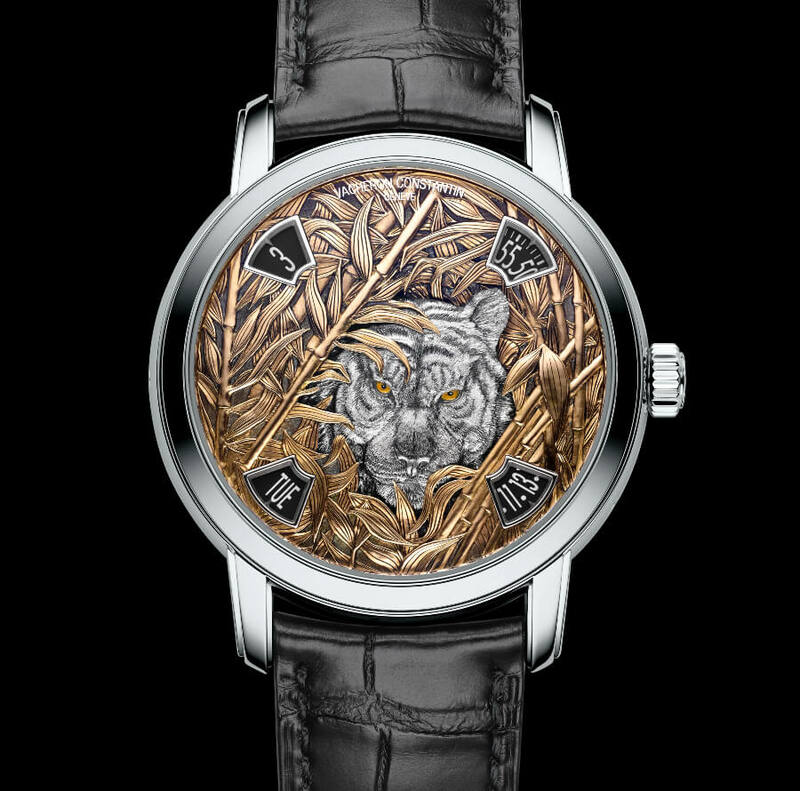 Jungle animals lend themselves to this daring composition, with a tiger emerging from a bamboo forest and appearing at the centre of the dial that is entirely hand-engraved with an infinite sense of detail. 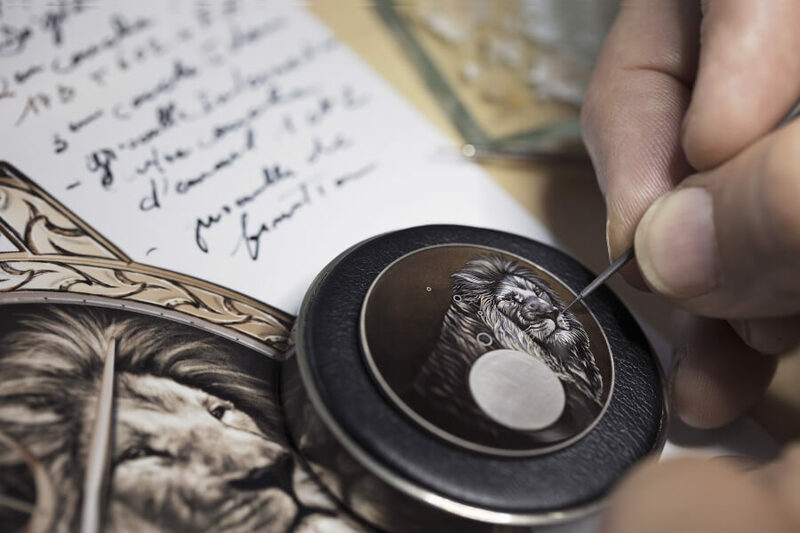 The ancestral technique of fine line engraving requires at least five years of experience to master its incredible finesse, with this intaglio-type sculpting of the material highlighting every strikingly realistic detail. The animal merges naturally into the surrounding plantlife of the jungle decor. This creation stages a remarkable balance between the strength of these divine messengers – whether symbolising family protection or happiness – and the foliage through which it roams wild and free. 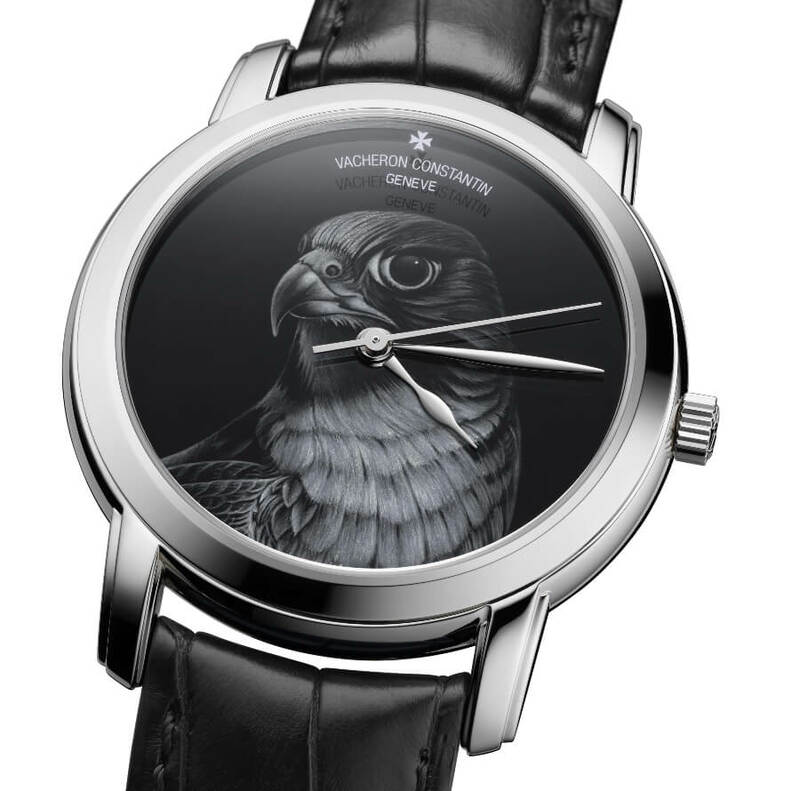 The power and grace of the falcon, king of birds, inspired the decoration in Grand Feu grisaille enamel “Blanc de Limoges” adorning the dials of this extraordinary model. Expertise and rigorous discipline are once again the watchwords in mastering this art, since firing between 800° and 900°C proves extremely delicate given the risk of burning the dial. The deft touch of the master enameller endows this animal with visually striking bearing, posture and expression. The effect is even more apparent on these more sharply de ned black and white dials crafted using his expertise. This model is driven by an extremely reliable self-winding movement, equipped with a stop-seconds device bringing the seconds hand to a halt so as to enable more accurate adjustment, as well as enjoying greater longevity thanks to the ceramic ball bearings on the oscillating weight. All the prices for the Vacheron Constantin Les Cabinotiers “Mécaniques Sauvages” Timepieces are upon request.